Can I allow my customers to set the price? Most of the pricing options on your 3dcart store involve creating products with static prices assigned to them. However, in some cases, you might need to specify a product where your shoppers can set the price. 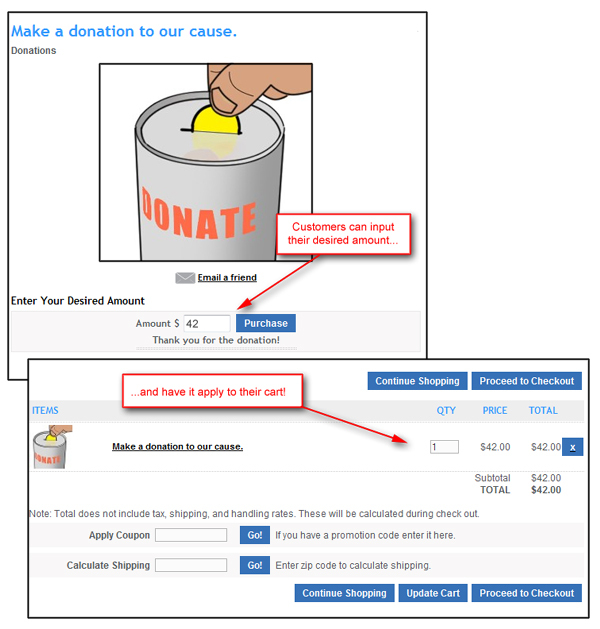 For example, perhaps you'd like to offer a donation type of product where the amount is set by the customer, or you'd like to offer a gift certificate where the customer can personally set the gift certificate amount themselves. The following information is being provided solely as a courtesy. Please understand that 3dcart support is neither qualified nor trained to provide HTML editing support. If you are uncomfortable with editing HTML, we also have design services available which can provide this service for you. Please contact our Sales department for more information. The first step in the process will involve retrieving a copy of the listing template that is normally used for your product listings. We'll be editing this file and using the modified version for your custom priced products. So first, we'll need to retrieve the appropriate template file from your store's FTP folders. The process will differ depending on whether your site is using an HTML5 theme or a non-HTML5 theme. You're renaming the file in this early step in order to ensure you don't mistakenly appliy it to all of the products in the store. By naming the file listing_10.html the listing style (inside your store) will appear as listing style 11. You can then safely apply this style to only the products that need custom pricing. Open up the file in your HTML or text editor. In the code found between these two tags, find the "[price]" code and change it to "Enter Amount Below"
The above change is needed so that the product's "Your Price" section indicates to your shoppers that their desired amount will be entered further down the page. Of course, you may change the wording as neeed if you want it to say something other than "Enter Amount Below." Your Theme Folder will be located via FTP by navigating to "/web/assets/templates/[theme-name]" If you do not know your site's current theme name, navigate to Settings ->Design ->Themes & Styles in your 3dcart Online Store Manager, where the name will be shown at the top next to the label "Selected Theme." Use these instructions if your store is currently using a non-HTML5 theme for its design. You're renaming the file in this early step in order to ensure you don't mistakenly apply it to all of the products in the store. By naming the file listing_10.html the listing style (inside your store) will appear as listing style 11. You can then safely apply this style to only the products that need custom pricing. Now, search for "[product_quantity]" and change this tag to "Enter Amount $"
The above changes are needed so that the product's "Your Price" section indicates to your shoppers that their desired amount will be entered further down the page. The second change is to show where the amount is entered. Of course, you may change the wording as neeed if you want it to say something other than "Enter Amount Below" if you wish. Now that the template has been modified and uploaded, you will need to assign the listing template you created so that it applies to the custom price product(s). Click on the product's "Advanced" tab. For "Listing Template" select "Style 11"
Once complete, the product will allow your customers to set the purchase price as they would like.